This Strawberry Shortcake Baked Alaska is absolutely scrumptious and the perfect dessert for any occasion, especially a hot summer day. Golden buttery pound cake sits underneath some delicious frozen strawberry sorbet and then topped with fluffy, toasted marshmallow meringue. We love everything having to do with meringue and have been on a total meringue kick ever since we got back from our Alaska Cruise. Lemon Meringue Cookies, Alaska Glacier Martini topped with these easy to make Meringue Cookies Recipe, just to name a few! We recently returned from the most amazing cruise to Alaska on the Island Princess. There were so many beautiful things we saw in Alaska….the glaciers, the wildlife, and of course….the desserts! When you think of a luxurious cruise, you cannot help but immediately think about the amazing food you are going to experience. One of my favorite nights is Baked Alaska night! 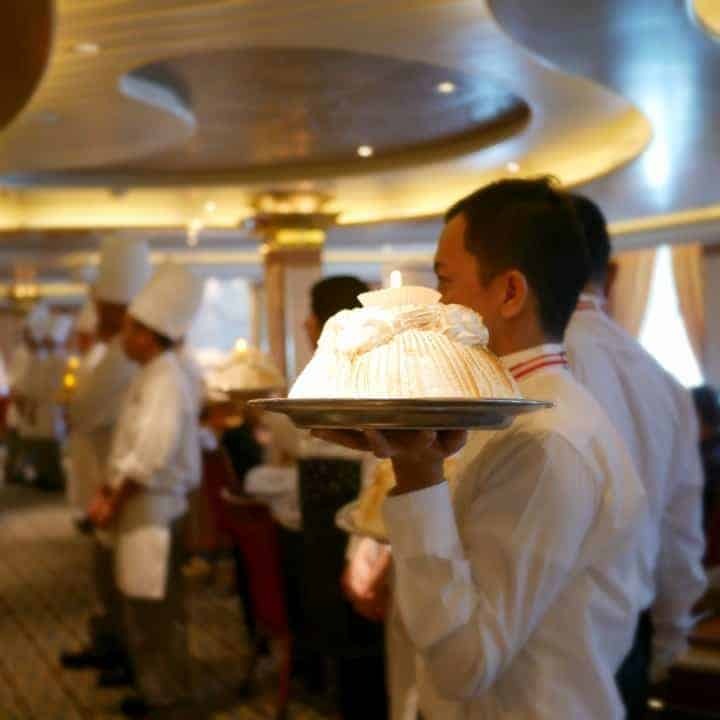 That is when the wait staff in the dining room parade around with gorgeous flaming Baked Alaska’s! It is by far my favorite night in the dining room! Of course, our cruise to Alaska was about more than just the food! But, I do have to tell you, my meal at their Italian restaurant, Sabatini’s, may have been one of my favorite meals ever! As I was saying, it was more than just the food, it was about the beautiful ship, the amazing staff, the incredible excursions (especially our helicopter ride and hike on the Mendenhall Glacier) – but the food was really, really good! 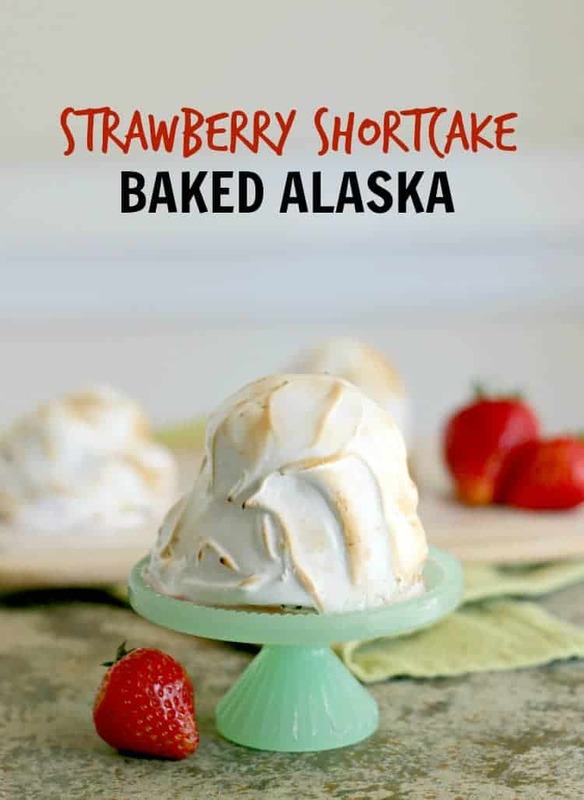 This Strawberry Shortcake Baked Alaska dessert recipe isn’t just delicious it’s easy to make and very versatile. It is also unique because this recipe makes individual servings! You will wow your guests with the beauty of this dessert! You can swap out the strawberry sorbet for chocolate ice cream or another sorbet flavor, use ice-cream instead of sorbet…even swap the buttery pound cake for a piece of brownie. No matter what combination you come up with, you can’t go wrong with the refreshing dessert. 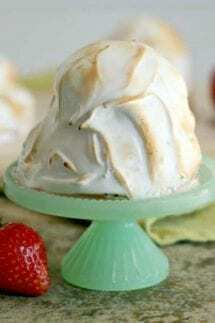 Baked Alaska is a dessert consisting of cake (sponge cake, pound cake, etc) with ice cream topped with browned meringue. It is believed that it was created to celebrate the United States acquisition of Alaska. This is not your ordinary ice cream cake! The recipe uses a thawed, pre-made frozen pound cake. 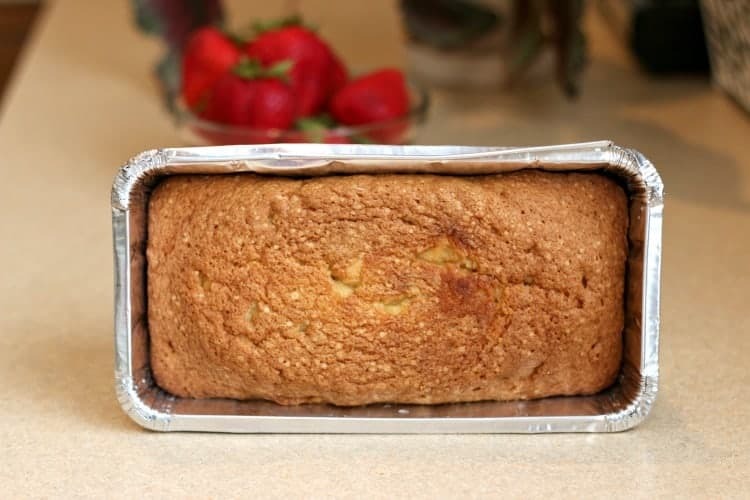 If you have a favorite homemade pound cake recipe, go for it! To get started, slice the thawed pound cake in half length-wise, and then again from top to bottom, cutting three sections. This should give you six square pieces of pound cake. 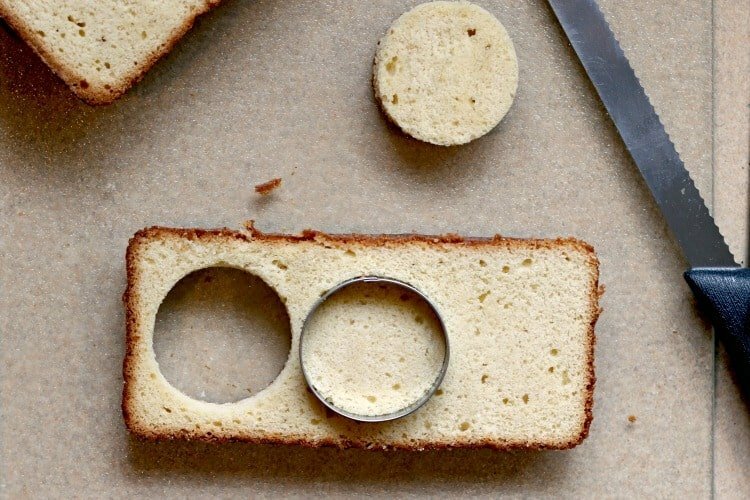 Next, you’ll need to use a 2 or 3-inch circle cookie or biscuit cutter to make pound cake circle. Once cut, set the cake rounds to the side. Now it’s ice cream time! Place six scoops of strawberry sorbet or strawberry ice cream into a cupcake pan or lined baking sheet and place in the freezer for 15 minutes. For the meringue, you need egg whites, granulated sugar, and vanilla extract. Combine the egg whites and sugar in a heat proof bowl and set over a pot of simmering water. Stir until the sugar is completely dissolved. Sometimes I’ll use fine granulated sugar (if I have it in the house) simply because it speeds up the time it takes for the sugar to dissolve. To test if sugar is dissolved, dip your spatula in the mixture and run your finger over the surface. If you feel the grains of the sugar…keep stirring! Once sugar is dissolved, stir in the vanilla extract, salt and cream of tartar. 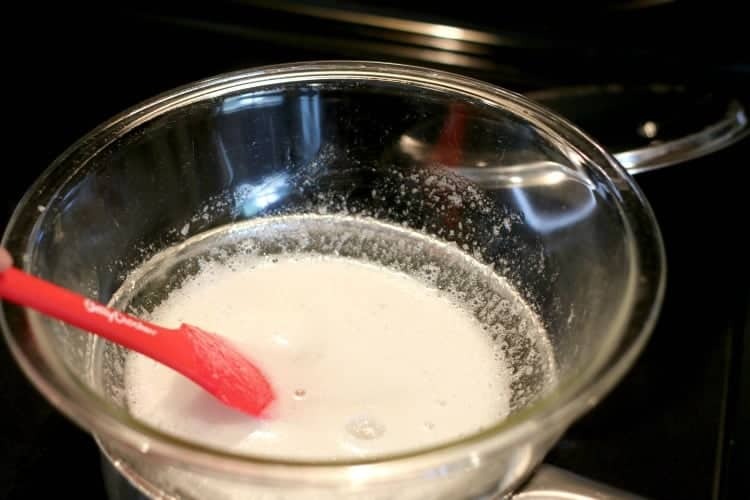 Transfer the meringue mixture to the bowl of your mixer and using the whisk attachment, beat on medium-high until stiff peaks form and meringue is cool to the touch. Be patient, it can take 10-12 minutes for the peaks to stiffen. Make sure that your mixing bowl to clean and free from any oil or residue otherwise you’ll struggle to achieve stiff, glossy peaks with the meringue. You have two options at this point; you can fill a pastry bag fitted with a large plain or star tip with the meringue and pipe it over your dessert, or you can keep the meringue in the bowl and use an offset spatula, spoon or rubber spatula to create decorative meringue swirls. 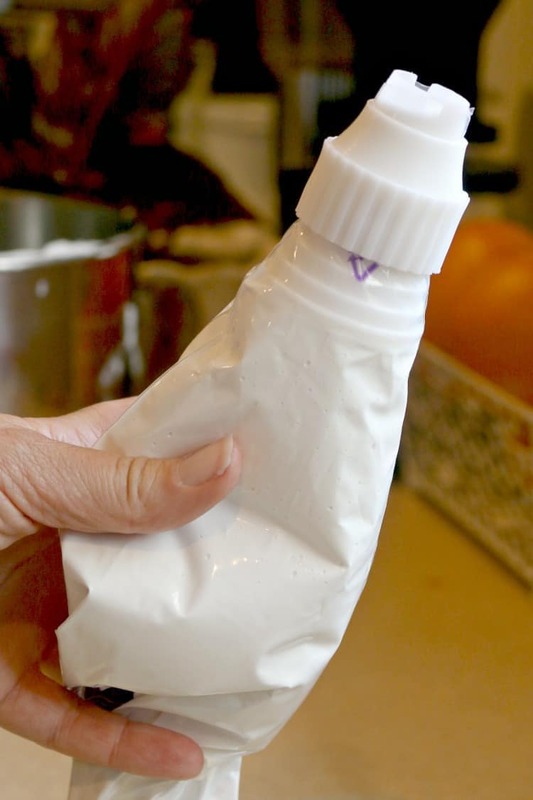 Little tip…the pipping bag is MUCH easier when applying the meringue. Then use the off-set spatula to spread the meringue. Now it’s time to assemble this heavenly dessert. Place a pound cake round on a flat surface and top with a single layer of fresh sliced strawberries, followed by a scoop of the strawberry sorbet or strawberry ice cream. Both are DELICIOUS! Place back in the freezer until you top all cake rounds with sorbet. This is a great stopping point if you will be making this dessert in two phases. When ready, pipe or spread the meringue starting at the bottom working your way up to the top. If you are using a piping bag, you can create a giant swirl pattern or pipe tiny little stars over the dessert. 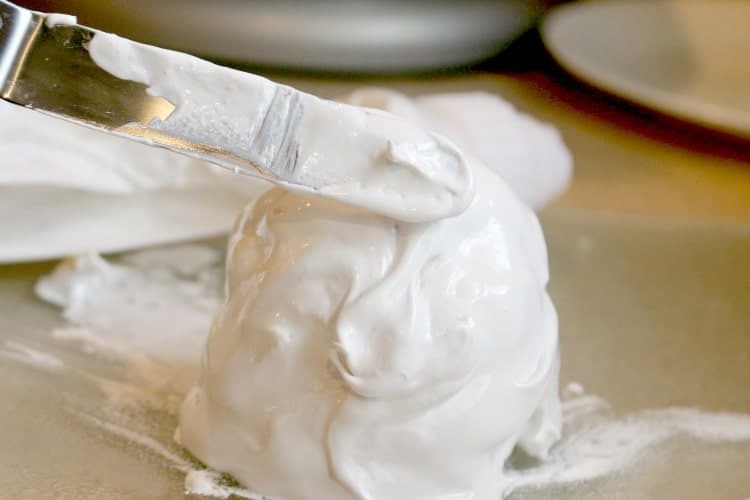 If you are using an offset spatula, simply smooth the meringue from bottom to top and then create swirls and peaks. This can get a bit messy but don’t worry, that’s completely normal! Using a butane kitchen torch, toast the marshmallow surface to your liking. If you don’t have a kitchen torch, you can place the dessert in the oven and broil 5-7 inches away from the heat for about 30-45 seconds. Leave the oven door open and monitor; it doesn’t take long for the meringue to turn a beautiful golden brown. 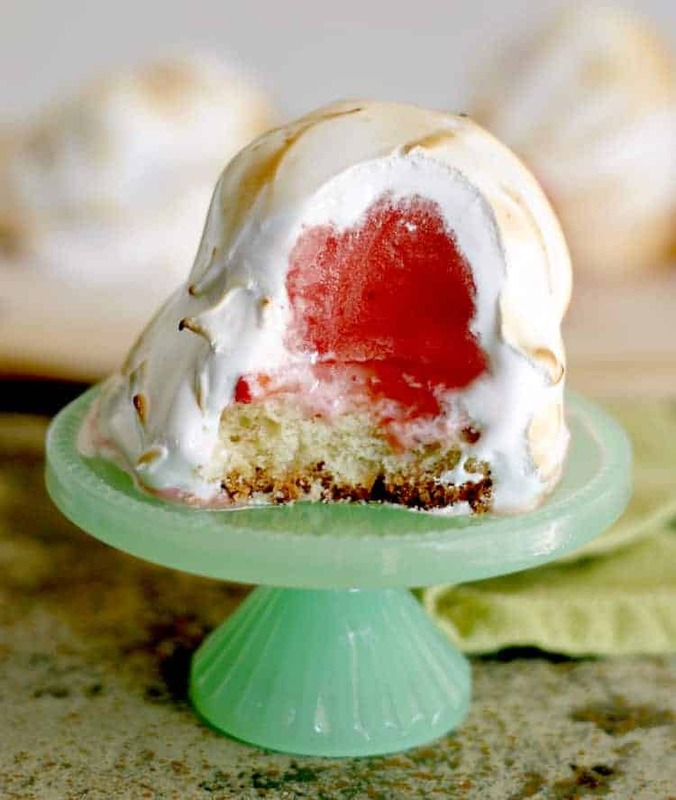 This Strawberry Shortcake Baked Alaska can be made a day in advance which makes it the perfect dessert for entertaining; simply cover lightly, and store in the freezer. 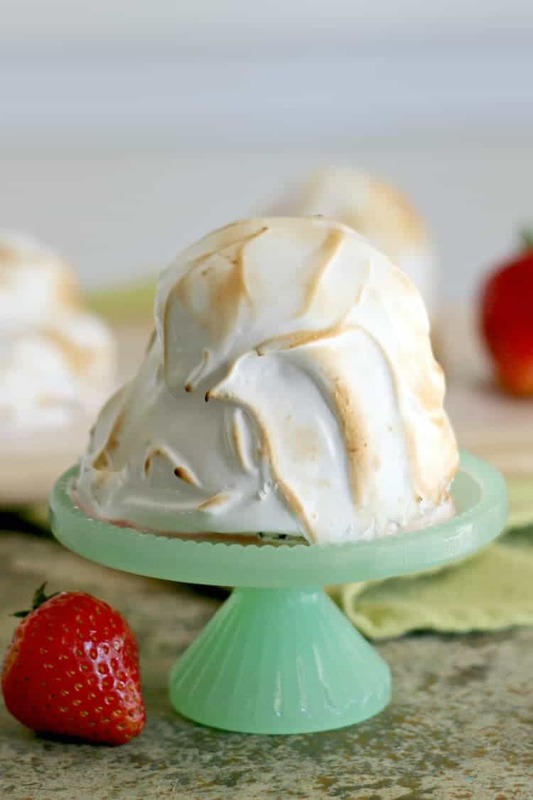 So next time you are craving some Strawberry Shortcake or Baked Alaska or just looking for a refreshing summer dessert, this Strawberry Shortcake Baked Alaska will hit the spot and quickly become favorite family dessert. If you’re interested in hearing more about our Alaskan cruise, check out our Alaska packing list and Alaska Cruise excursion recommendations. Golden buttery pound cake sits underneath some delicious frozen strawberry sorbet and then topped with fluffy, toasted marshmallow meringue. 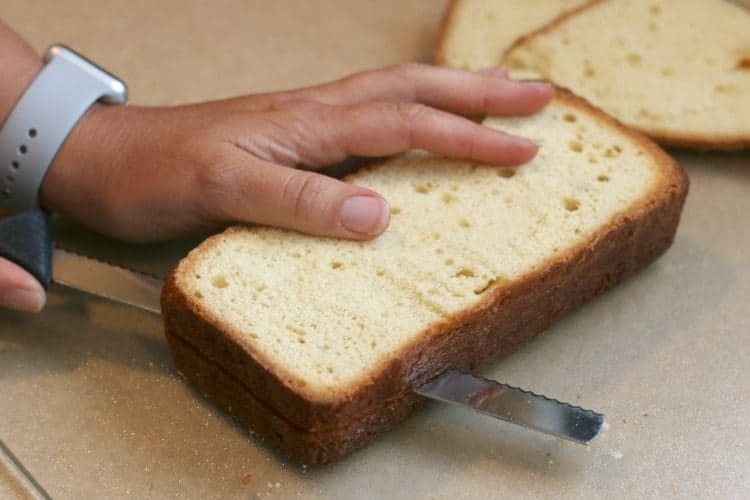 Place thawed pound cake on cutting board and using a bread knife, slice cake down the middle horizontally. Using a 2 or 3 inch round cookie cutter, cut out 6 cake circles and set aside. Wash and slice fresh strawberries, set aside. 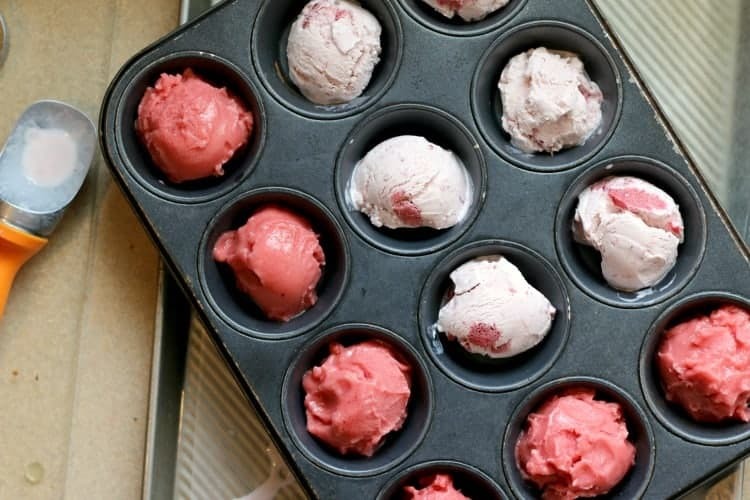 Place six scoops of strawberry sorbet or strawberry ice cream into a cupcake pan or lined baking sheet and place in the freezer for 15 minutes. In a heat proof bowl, combine egg whites, sugar and vanilla extract. Set bowl over pot of simmering water and stir constantly until sugar is completely dissolved. Mixture should be warm to the touch. Removed from heat and pour into bowl of mixer. 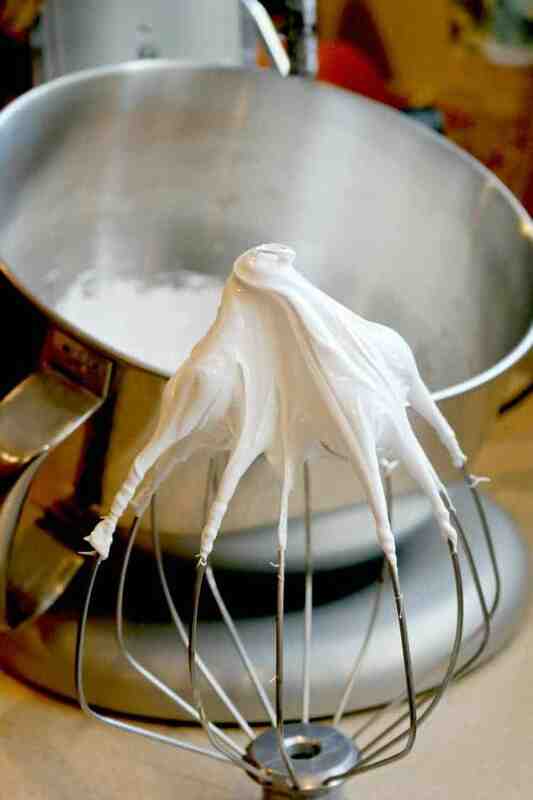 Using the whisk attachment, beat of medium-high speed until stiff peaks form and meringue is cool. Fill meringue in pastry bag and set aside. Place a couple slices of strawberry on top of each cake round. 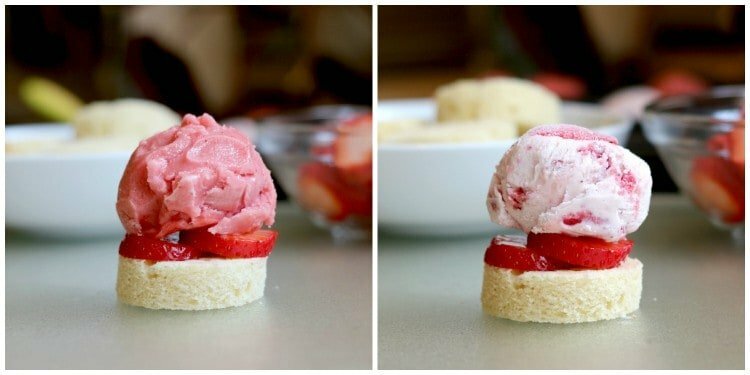 Place a scoop of sorbet or ice cream on top of the strawberry slices. Place all topped cake rounds back in the freezer. Remove from freezer one at a time to top with meringue. 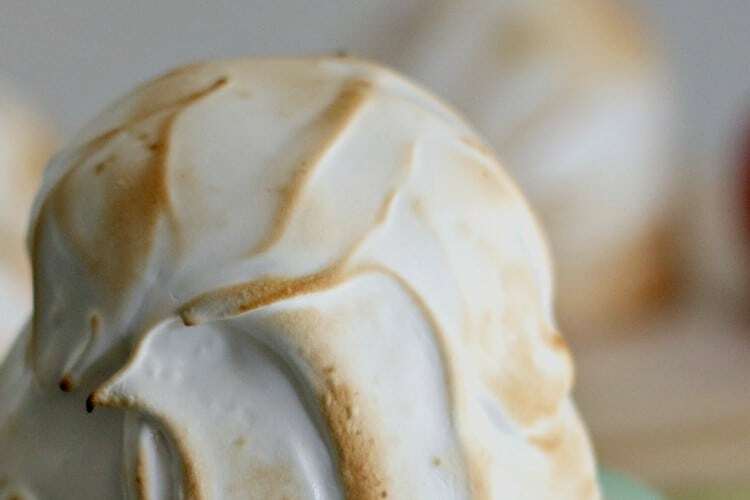 Use a kitchen torch to lightly toast marshmallow meringue. If you don’t have a kitchen torch, place dessert in the oven and broil 5-7 inches from the heat for 30-45 seconds. Leave the oven door open and monitor; browning happens quickly. Serve immediately or place back in freezer until ready to serve. genius! 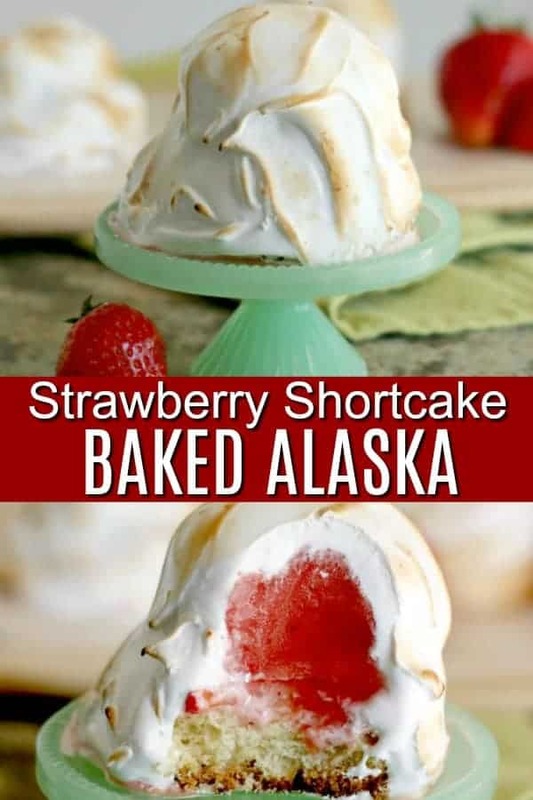 i love this take on baked alaska!!! 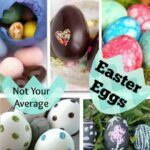 This is such a fun idea, and I loved my Alaskan cruise! Best trip ever! Oh my gosh. They look so cute! And yummy! I just got a mini torch to make creme brûlée. Your recipe gives me another good excuse to use it! This is such a fun idea! 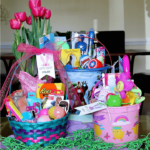 My family would go crazy for it!